EU Enlargement Commissioner Guenter Verheugen has said he is "confident" a deal to reunite Cyprus will be struck before it joins the EU on 1 May. EU membership will, in effect, apply only in the Greek-speaking south of the island unless a deal is reached by May. UN Secretary-General Kofi Annan has invited Cypriot leaders to New York next Tuesday for a renewed effort. Mr Verheugen said a resumption of talks meant "that both parties had already agreed" there would be a settlement. "Kofi Annan's conditions are very clear," he said. "My understanding was that he would not resume talks without sufficient guarantees of both parties that his conditions are met." Mr Verheugen also said he was ready to head a high-level EU team to New York next week to support the negotiations. His comments came after a meeting with Turkey's Foreign Minister Abdullah Gul in Brussels. Mr Gul also said their intention was to "finish everything before 1 May". 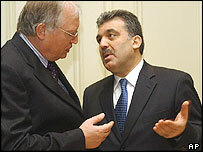 But Turkish Cypriot leader Rauf Denktash criticised Mr Annan's invitation to quickly resume talks. "The date of 10 February is an imposition," he said. "We did not decide on this date, they are putting our feet in one shoe." Mr Denktash walked out of the negotiations last March, but agreed to return last month after coming under considerable pressure from Turkey and a new government in northern Cyprus. Now the UN says Mr Denktash and Cypriot President Tassos Papadopoulos have been invited to resume discussions ahead of a possible April referendum. The Greek, Turkish and British prime ministers will also be invited to have representatives on hand for the talks, the UN said. Mr Annan wants a deal to be reached by the end of March, so the people on both sides of the divide can vote on a proposed peace plan in April. Cyprus has been divided since 1974, when Turkish troops invaded the north of the island in response to a short-lived Greek coup. The self-declared Republic of Northern Cyprus is recognised only by Turkey.